Cafe 48 (AKB Maid cafe AU) - Chapter 2 "The first day"
Okay, so I've always wanted to go to a maid café in Japan! And Jurina's recent maid cosplay is just... too freaking cute! "Excuse me~" Matsui Jurina called out as she opened the door, stepping into the office of her producer, Akimoto Yasushi. She sat down in her seat, facing the man. "You wanted to see me, sir?" "Yes, I wanted to talk with you about a new project for AKB." "It's something I want to experiment on regarding the service being provided at the AKB cafe. Something that would mix things up for fans and, if successful, we can branch this project out to the other sister groups' cafes." "What kind of project is it?" "I've noticed that certain members and kenkyuusei have less opportunities for work outside of theatre stages, so I would like to see what it would be like to have members working at the cafe and serving the fans. Similar to how maid cafes work." "A maid cafe?!" Jurina's eyes widened. Immediately, her mind went back to her recent maid cosplay during a handshake event. Her cheeks turned pink remembering how she answered to fans' requests and said some rather cute but still embarrassing phrases. "And I would like you and several other of the current senbatsu members to be the ones promoting this new project." "Really? Eh?" Jurina blinked. "Is that alright? I have no experience with working at a maid cafe!" "Don't worry. I plan for a pro to come help you girls learn the basics. Besides, you're quite the chef, aren't you, Matsui?" "Ah... yes sir." Jurina smiled shyly. Indeed, she loved to cook. "So, who else is part of this project?" "Along with you, it'll be Komiyama Haruka, Yoshida Akari, Kodama Haruka, Okada Nana, and Miyawaki Sakura." "What do you think? Are you up for it?" The man asked, crossing his arms. After thinking the idea over, Jurina's lips curved in a grin. "Sakura-tan, Haruppi!" Okada called out to the two girls who were waiting just down the street. 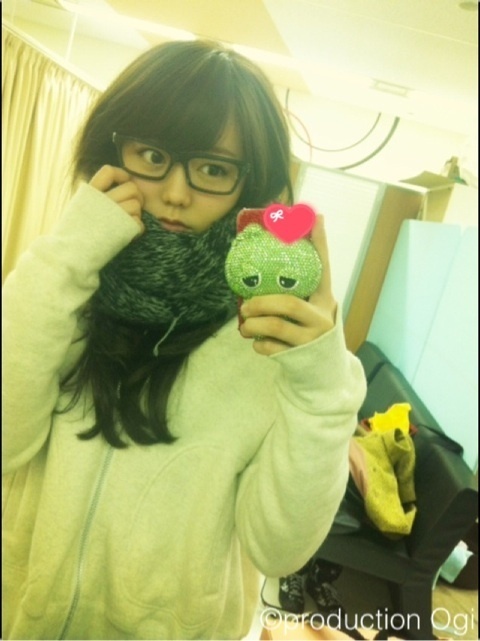 Having just left the train station, she made her way towards the AKB cafe and saw the two getting off at a bus stop. "Ah! Nana-san!" Sakura smiled as the short girl joined them. "I'm good. How about you girls?" "We're good. We were just heading out for lunch when we got a text from Jurina-san." "You too, then..." Nana tapped her chin. "Interesting." "Eh? Jurina-san invited you, too?" Haruppi's eyes widened. "Yes. She said she was going to treat me." The three started walking toward the cafe together, talking about work and other things. As they got closer to the cafe, they saw a familiar figure standing outside, taking a selfie. "Uwa! It is!" Haruppi smiled. They then saw a taxi pull up and none other than Yoshida Akari stepped out. When she saw Komi, her eyes widened and they both looked at each other with surprise before smiling and greeting each other. "Komi-chan! Akarin-san!" Nana waved to them, catching their attention. "Lemme guess," Sakura pulled out her phone. "You both got texts from Jurina-san, too?" "We all got the same text! So Jurina wants to treat us all to lunch?" "I wonder if it's a special occasion." Re: *New fanfic* Cafe 48 (AKB Maid cafe AU) - Prologue "A new project"
Maid Jurina: It's "moe moe kyun!" Maid Jurina: Here you go! First chapter! It's time for the girls to begin their training! “Jurina-san? !” The five girls were greeted by their senior, Jurina, clad in a black maid outfit with a pink ribbon on her chest. Her sudden greeting was caught them off guard, and they all stood at the door confused. "I just wanted to surprise all of you," Jurina grinned, her cheeks quickly turning pink. "Ahh~ I have to get used to this, though..."
"You said you were going to treat us to lunch. Is this what you meant?" "Well... that's part of it. Now, come in. Sit down." She led the group to a table to sit at, clearing her throat to begin the explanation. "The truth is... this is actually part of a new project Akimoto-sensei wants us to do." "He wants to have AKB members working at the cafe and serving fans. And he's chosen us to promote the new campaign!" "So, why the outfit?" Nana asked, pointing out Jurina's attire. "Well... he kind of wants it to be like a maid cafe," she answered with still pink cheeks. "Ehh~? A maid cafe," Komi smiled. "Sounds interesting! I've always wanted to work at one." "Seems like it'd be a lot of work, though," Haruppi said. "Remembering all those different routines on how to do your job." "Plus, it seems a bit embarrassing," Sakura commented. But in the back of her mind, she found Jurina dressed in that outfit simply too adorable. Nana's eyes lit up. "Why don't we try, though?" "This would be a good experience not just for the fans, but for the members! Not only will we get to see more of our fans on a regular basis other than theater shows and handshake events, but working at the cafe would help with our skills in cooking, and teach members about hard work!" "There it is! Majime Naachan." "Right?! I bet that's what Akimoto-sensei had in mind! So let's try it out! Let's give it our all, the six of us!" "You're right," Akari agreed. "Plus, I can help promote the project on my YouTube channel." "It'd probably make for cute Instagram-worthy posts, too~"
"Uwaa~ now I'm excited! Sakura-tan!" Haruppi shook her friend's shoulder. "Let's do it!" "Perfect!" she gave a thumbs up. "Well, as a demonstration, I'll be happy to take your orders. I promised lunch, after all~"
After a filling lunch for their bellies, the girls were brought to the back room of the cafe. They decided to close up shop early so that the six could officially begin their training as maids. They changed into their uniforms, all of them admiring the look of it. Sakura's had the colors inverted from Jurina; a pink outfit with a black ribbon. Haruka's was purple with a red ribbon, Komi's was yellow with an aquamarine ribbon, Nana was light blue with a green ribbon, and Akari was red with a gold yellow ribbon. "You all look so cute~" Jurina commented, giggling. "Hey, Jurina-san, what are these necklaces?" Haruppi asked, holding up a small, pink star-shaped necklace. "They correspond with the Call Buttons we've been given," Jurina held up one and pressed it. The necklace that was on her glowed and made a ringing tone. "When the customers are ready to order, they push the button and call our names." "Now then, since we're all changed, it's time to meet our teacher!" "Hai~ Nice to meet you, girls!" A cute maid girl in a blue and white outfit greeted them cheerfully. "My name's Amane-chan!" "Amane-senpai is an intern working at the maid cafe, Maidreamin. She's going to be teaching us the ropes on how to work as maids for the AKB cafe," Jurina explained. "She's already shown me some of the basics early this morning, so I'll leave it to her." "Yoroshiku onegaishimasu!" the five bowed diligently. "My, you're all so cute in your uniforms! However, a maid doesn't just look cute! You have to act the part, as well." "A maid must always greet their customers with a clear voice and a charming smile!" "Okay..." Haruppi took a deep breath before starting, "Welcome back, mashter!" She blushed a bit before covering her mouth, the others giggling a bit. "Sorry. I bit my tongue there," she quickly apologized before starting over. "Welcome back, master, milady! Ahh~ I said it that time!" Nana cleared her throat a bit, stepping up. "Welcome back, master, milady." Komi went next, stepping forward with a bright smile, as usual. "Welcome back, master, milady!" Sakura then went next. "Welcome back, master, milady. ...Ahh, embarrassing~"
"Last is me, then," Akari then stepped forward. "Welcome back, master, milady." Amane applauded them. "Nice job, girls! Haruppi-chan, later, we'll practice with some tongue twisters to take care of that lisp." "I was especially impressed with Naa-chan! She has a clear voice and straight gaze, very good!" "Thank you!" Nana bowed diligently. "Moe moe kyun~" All of them spoke, mimicking the hand movements Amane had taught them. "One more! 1, 2, moe moe kyun! Say!" "Ahh... so embarrassing," Sakura whispered to herself. "Moe moe, kyun kyun!" Amane slowly shook a drink shaker in her hand, Akari and Komi mimicking her. "And as you say that, shake with all your might with one last, moe~! Hai!" "MOE!!!" Akari and Komi shook with all their might before pouring out the drinks. "Oh! It turned out really good!" "Make a heart mark, like this," Amane showed Nana the gesture, having her mimic it. "And then, hold it out and shoot the moe beam!" "Moe beam~" Nana held her hands out at the cookies in front of them. "Put your love and excitement into it! Beeeeam!" "Did it work?" Nana wondered, taking one of the cookies and eating them. "Ah! Yum!" "This is the most important part," Amane said seriously as she handed a bottle of ketchup to Sakura and Haruka. 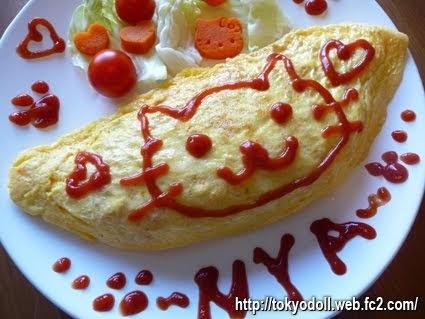 "Perfecting ketchup drawings is like a sacred art to every maid in every maid cafe. It takes lots of care and patience to master." "Uwa... that's a bit of pressure." "D-don't worry, Sakura-tan! Let's do our best!" "Then, I'll give you a simple request," Jurina said, setting out two plates of omelette rice waiting to be decorated with ketchup. "Draw a dog. Specifically, a toy poodle, like my precious Lips-kun~"
"A puppy... That's simple enough." Sakura psyched herself up. "Yosh! Let's do this!" The two went to work, drawing out the head of the toy poodle. Haruppi's made hers look almost like a cloud, resembling the fluffy fur of a toy poodle. Sakura soon started on the ears, even adding a cute ribbon on each side. "Ah, cute~" Nana commented as Sakura then went to the face. Haruppi started on her face, as well, her eyes much bigger compared to Sakura's. She then made the mouth and had a small bit of tongue sticking out. Sakura made the nose and connected the mouth from there, soon starting on a collar. "Eh? Nani?" Jurina leaned forward, curious. While Haruppi was now writing a message, Sakura drew out a collar tag shaped like a heart. "Kawaii!" Komi commented, seeing both of their works as they finished. "Ahh! I can't choose which one is cuter!" "You both did very well, in my opinion," Amane said. "As you girls learn how to handle the ketchup bottle, you'll soon learn how to draw more complicated pictures, even anime characters, if one customer so desires." "Great! So, when do we officially start?" "We have a photoshoot in these outfits tomorrow," Jurina explained. "After which, we'll have a press event to promote the project, and then, the day after, we officially start working! So, with that in mind, let's wrap up here with the final lesson." Jurina smirked and soon placed something on Sakura's head. Sakura touched the pair of white cat ears on her head. Jurina placed her own cat ears on, posing with her hands. "Nyan nyan~ this is an important skill for maids, too! Right, Amane-senpai?" Sakura blushed heavily, everyone else giggling. "Aw~ it's so cute, Sakura-chan!" "Don't be so shy about it." "Right! There's a likely chance a fan will want to see this kind of Sakura-chan, too!" "Mou! I can't resist it!" Komi hugged Sakura and took out her phone. "Say cheese!" "I promise I won't post it on Insta!" Re: Cafe 48 (AKB Maid cafe AU) - Chapter 1 "Lessons of a maid"
Since I'm out for X-mas break, I'm back! And I decided to change things up a bit! From now on, the chapters will be semi-drabbles! "Uwa~ I'm nervous!" Sakura said. "Don't worry, Sakura-chan! We can do this!" Nana gave her some encouragement. Haruppi nodded in agreement, hugging her friend. Jurina then announced, "Alright, girls! We're open for business!" "The masters and mistresses have arrived!" Sakura and Nana approached a table where three men were sitting, ready to order. "I'll have a Sakura-tan special sandwich set." "I'll order the Juri-nyan omurice set." "So two sandwich..." Sakura began to punch in the order. "Ah! And for drinks, I'll have oolong tea." "Two sandwich sets with oolong, and one omurice set with iced coffee," Nana repeated. "Right away, masters! Let's go, Sakura-chan!" "Eh?!" Sakura's eyes widened as Nana walked off. "Sugoi..."
"Hello! Are you ready to order, masht--ah!" Haruppi blushed, realizing she bit her tongue. "S-sorry! Are you ready to order, master, milady?" "Yes. We'll both have the Naachan Curry set. Cola to drink." "Righth away! Ah, sorry! I did it again!" The two chuckled. "Not at all!" "Haruppi-chan's lisp is so moe." "Ah! Ahh~ I see! Then, I'll get your orders ready, mashter, milady!" "With Komiharu smile, become delicious~" Komi spoke as she handed out their food. "Did it actually make the food delicious?" The two young college students tried out some of the spaghetti on their plates, slurping up the noodles. "Amazing~ Who knew maid cafes could be like this?!" As Komi was dismissed, she reunited with Akari, who nudged her arms. "This cafe is meant for us to appeal ourselves, right?" Komi grinned. "You should try advertising your YouTube channel. I overheard a table of some high school girls talking about you and your makeup tutorials." "Ah! I messed up!" Sakura sulked as she accidentally squirted out too much ketchup onto the omelette. "Oh, it's okay, Sakura-tan. I like a lot of ketchup, anyways," the customer said to comfort her. "Woah~ dude, look at this!" He showed them the drawing that Jurina had made; a sun shining on a flower with hearts around it and the message, "Daisuki!" on the plate. "Woah! That's amazing, Jurina-san!" Sakura said in awe. "Just takes a little practice. You'll get the hang of it too, soon, Sakura-chan." "Hey, December's coming soon, right?" Haruppi asked. "Right! And you know what that means!" "Hey!" Akari raised her hand. "What do you say we all meet here and help decorate the cafe for the Christmas season?" "That sounds good, Akarin!" Komi smiled brightly. "We should get a tree!" Nana pointed out. "But should it be big? Or maybe just a small one...?" Sakura pondered on the thought. "What if we got... an AKB themed tree?" "Yeah. A pink tree, with photos of the members, and messages written to fans on it." "Alright, first thing this Sunday, we'll search for a pink tree!" "Hands in!" Jurina reached her hand out, everyone else going in. "We're gonna make this place look super festive!" Re: Cafe 48 (AKB Maid cafe AU) - Chapter 2 "The first day"
Haven't read a fic on this topic yet. Seems like it will be interesting. Interesting to see each member during each of the lessons. Seems like they have natural talent for this. I like how each member's character is shown with the interactions with the customers. Looking forward to the Christmas tree. Page created in 0.444 seconds with 18 queries.